If you're looking for a poker tournament clock stocked full of features, then look no further than The Tournament Director. It's ideal if you're looking to host a full-fledged tournament with multiple tables and includes such back-end features as receipt-making abilities, player information storage, and blind level suggestions. If you're looking for an easy companion when running a major poker tournament, you don't want to be without The Tournament Director. This is one of the most advanced poker clocks that I’ve ever seen. A dozen informational tabs greet a user upon entry, including a full game overview, blind customization, and player information. The Tournament Director will actually suggest a blind structure for you if you tell it the number of players involved and the length you’d like the tournament to run. There are a variety of pre-stored structures for you to use as well. The program records a full summary in case you need to refer to it at any point. 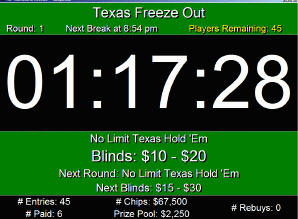 The main screen displays the number of entries, time remaining in the current blind level, color and value of the chips in play, payouts, and the current game type being played. You can even use The Tournament Director to play Omaha and other types of poker, which are displayed on the main screen. If there’s too much information for you to digest, the main screen is fully-customizable. A variety of hotkeys are also available. There’s a 30 day fully-functional free trial available. The program is $39.99 afterward.